You can now, because of Vole PageShare! 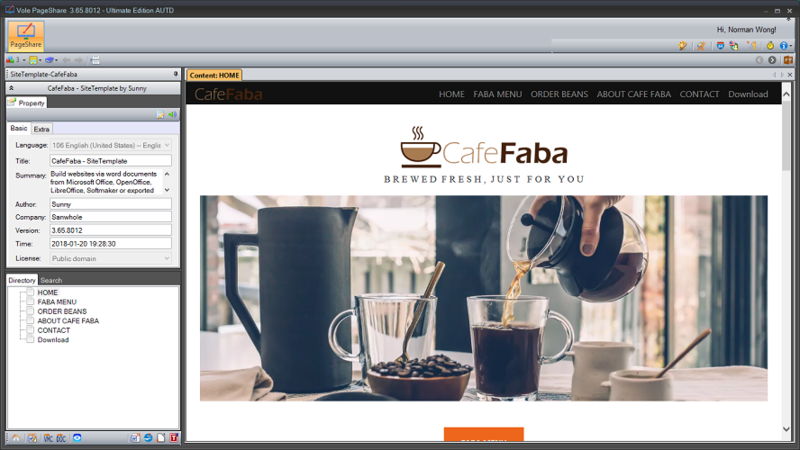 Create professional stylish charming websites based on documents. 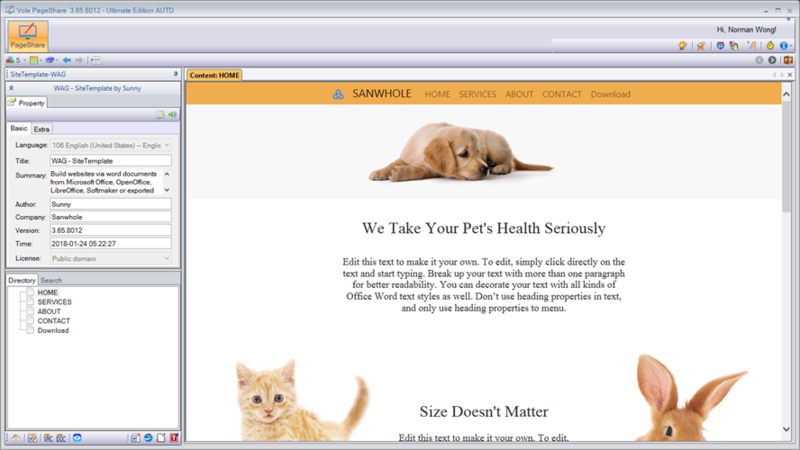 Vole PageShare can configure a variety of website styles based on your settings. For example, custom menu colors, predefined menu colors, menu left, menu centered, menu right, menu fixed-top, menu fixed-bottom; website brand, website logo, website favicon, picture auto scale, picture landing page, MP4 landing page, etc. Vole PageShare can make your site more stylish. Vole PageShare can add the current most popular controls to your web page. For example, slideshows, picture light boxes, picture amplification, accordion and so on. Not only that, Vole PageShare can also make your site more professional. Vole PageShare can add custom HTML to your web page. So you can easily add online videos such as YouTube, Vimeo. You can easily add client code such as chat software Zopim, blog software Disqus etc. Theoretically, you can try to add to your site as long as the site provides embedded code. Also, Vole PageShare can make your site more functional. Vole PageShare can add MP4 playback and download capabilities to your Web pages. And MP4 media and download files can be either network resources or embedded within the site. Uniquely, Vole PageShare can also create directory-form websites. Directory-form website displays website directory tree on the left that can be expanded and closed, the right side shows the content of the current selection page, and the content interacts. Similar in form to Windows Explorer. The directory-form website has powerful search capabilities, like a book that can easily manage more than 100 pages’ website. The directory-form website is especially suitable for large word processing files online sharing. Unlike PDF and file sharing, the directory-form website has all the features of the website and can share every page of the file. Each page has a separate URL. So you don't have to download all the files to see the internal content, like PDF and file sharing. Efficient off-line editing, Vole PageShare is designed to be able to edit your site offline. The advantages are obvious compared to online editing. It's thoughtful, and Vole PageShare also has a powerful website preview embedded in it. You can preview your site's effects through the preview in the editing process. Most importantly, Vole PageShare allows you to export your site at any time. Your website is pure, complete, and can be run independently. Your site supports HTML5 and other up-to-date network technologies. You can publish your website to any site space. 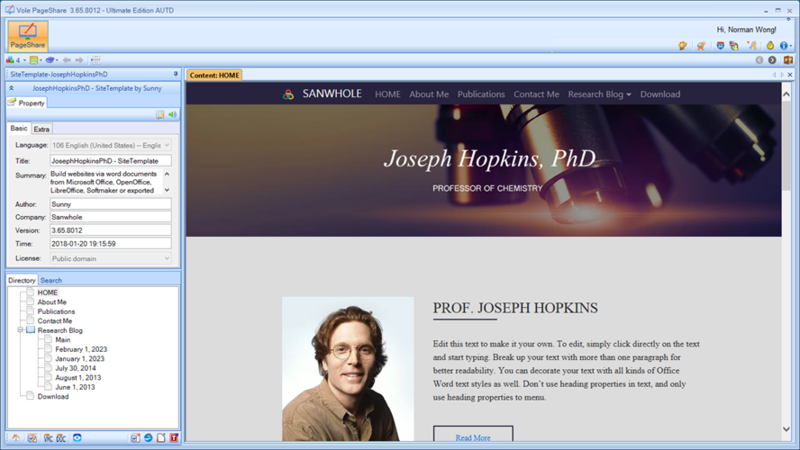 Of course, you can publish your website to our Sanwhole website space. Our website space is first-rate, to your service is fast. After all, we know our products best. Support for mainstream word processing software. All software that can be exported or saved as HTML is theoretically supported. 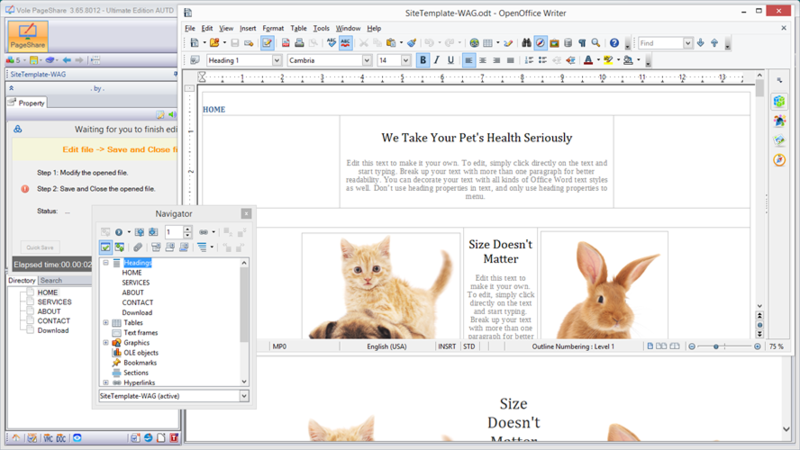 Vole PageShare can seamlessly interface with Microsoft Office Word, OpenOffice, LibreOffice and Softmaker word processing software. You can import DOC, DOCX, ODT, TMD files directly. 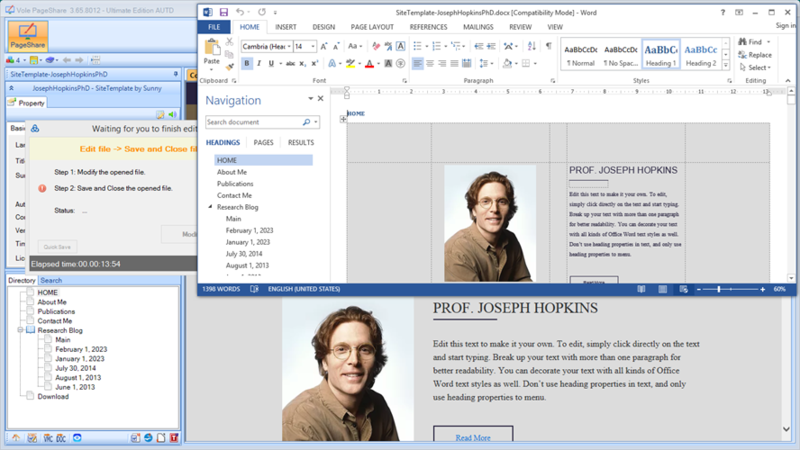 Vole PageShare supports Google Docs. 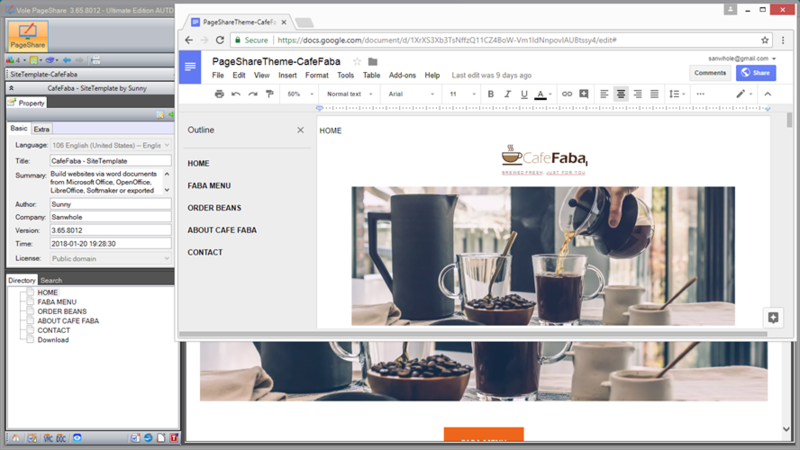 You can use the Google Docs download as zipped HTML feature and import the downloaded compressed HTML into the Vole PageShare. Vole PageShare supports Kingsoft WPS, you can save WPS as zipped HTML and then import it into Vole PageShare. Similarly, in theory, Vole PageShare supports all software that can be exported or saved as HTML. If you try, the results are not good, please let us know. Perhaps we can support it soon, thanks first. The supported format in the table below: the support list is increasing. In theory, it supports all the software and services that can save their document as HTML. In order to give you more information about the software, we use as many examples as possible on this page, such as MP4 Landing video, slides, accordion and a large number of pictures. This can affect the load performance of this web page. In the actual web design, you can use these features for different web pages.